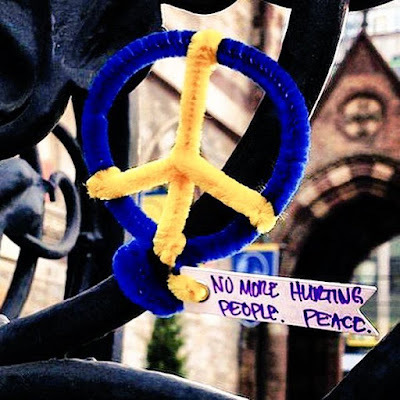 On #OneBostonDay, April 15, 2016, Old South Church in Boston, The Church of the Finish Line, marks the three-year anniversary of the Boston Marathon tragedies with a gentle Interfaith Service of Resiliency at 2:30 pm in partnership with the Massachusetts Resiliency Center. Former Governor Deval Patrick will speak and it will be broadcast live via New England Cable News (NECN). The service will pause at 2:49pm to observe the statewide moment of silence. The public is also invited to take part in An Expression of Resiliency on Canvas in front of the church from 12:00 pm - 2:30 pm. Old South Church in Boston is located 100 feet from the Boston Marathon finish line and since April 2013 has ministered to survivors and first responders including many in the congregation. The Massachusetts Resiliency Center provides support and services to victims of the April 2013 Boston Marathon bombings and related events. The Resiliency Center is a survivor driven and survivor led organization created to make the process of getting support and assistance easier for the widespread, global community of survivors.